This is not a forum for critical appraisals of public art. 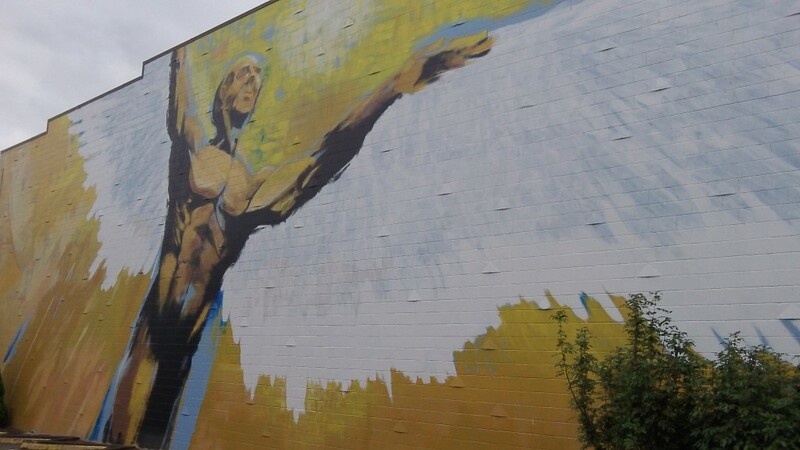 But let’s make an exception here for the Icarus mural that covers the entire side of a two-story building on First Avenue in downtown Albany. Does this, I ask you, does this look anything like the mythical Icarus? In case you’ve gotten a little rusty on the myths of ancient Greece: Icarus was the son of Daedalus, a technical genius who built a labyrinth for King Minos on the island of Crete. Minos needed the labyrinth to hold the minotaur, a creature half man and half bull and the offspring of his wife, but that’s another story. In short, Minos did not want Daedalus to leave the island with the secret of the labyrinth (how to get out again after getting in). So, skilled as he was, Daedalus built wings for himself and his son as a means of escape. He used feathers and wax, and he warned Icarus not to get too close to the sun or the wax would melt. They both took off, and being a teenager, Icarus forgot or ignored his old man’s advice. He flew too high, the wax melted, his wings fell off and he drowned in the sea. But look at him: That guy on the downtown wall is no boy. His hairless skull with the sunken eyes looks like he’s already dead. A zombie Icarus perhaps? Theresa Novak,on Facebook: Lol@zombie Icarus observation. Exactly. Marianne Vandenberg, on Facebook: LOL — certainly nothing like MY mind’s eye vision of Icarus! And gawdawful fugly, to boot! Patricia Louisiana, on Facebook: Ok, I’ll open this can of worms. It’s not the art, nor the artist, it’s the placement of the mural within the historical district. In a “Historical Downtown District” which holds numerous Historic tours, restricts businesses to uphold the historical nature of the area, why in the world was this allowed to be painted there for heaven’s sakes? 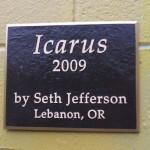 Michele LaBounty, on Facebook: Go to Google images, type icarus. 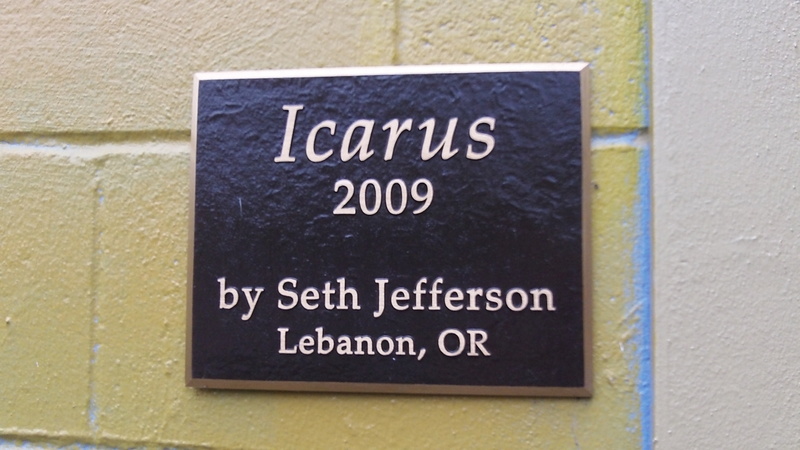 Please note that images of Icarus depend on the artist’s vision. Some of the images are very similar to the one many of you dislike. All art, whether you like it or not, enriches our lives. Stop complaining! Pat Eastman, on Facebook: Part of the problem, as I remember, was that the patron of the painting and the artist had a falling out prior to completion. Thus, the curious remainder. Art being in public view may not make it “public” art. Public art has a tax funding sound to it, which this work did not, to my knowledge. I find this public art no less odd or offensive than the painting at the corner of First and Ferry, which, no matter how hard I pray, has not had rattle-can alteration. Pat added this second thought: Possibly a poor choice of words. Vandalism was not my intent. A “repaint that matches the other downtown buildings” might have been a better choice of words? Passion overtook my thought. [He further explained:] The project was never finished, the painting was never completed. We only see what was completed prior to the dissolution of the agreement to paint the picture on the building. Half or so done as envisioned by the painter?